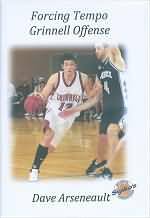 This basketball article is an introduction to Coach Dave Arseneault's fast paced high scoring Grinnell "system", and his two excellent DVDs (see below). Coach Arseneault, the head coach of the Grinnell College Men's basketball team (a Division III college in Grinnell, Iowa) coaches and teaches basketball a lot differently than many of us. Coach Arseneault has developed a fast-paced, high-scoring "system" that has resulted in a number of wins and championships for Grinnell. His teams have averaged 116 points per game and one player Griffin Lentsch scored 89 points in one game. He likes to recruit smart, quick athletes who can handle the ball and shoot the outside shot, and who are good decision makers. It's a "run and gun" offense with offensive possessions often lasting only five seconds in duration (12 seconds at the most), usually resulting in a 3-point shot. Grinnell tries to get over 100 shots per game and over 50 - 60% of those as 3-point shots. They crash the offensive boards with four rebounders, going for the long rebound off missed 3-point shots. Defensively, Grinnell full-court presses the entire game, using several press defenses, forcing the tempo, trying to create turnovers. They usually force about 28 turnovers per game, but their goal is 32. 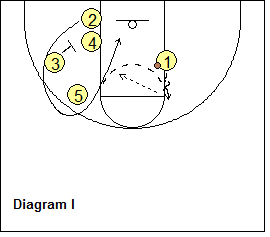 These forced turnovers often result in easy baskets in transition. Half-court defense is not a huge priority... opponents may score in the half-court, but Coach Arseneault believes his team can simply out-score them using their offensive system and their press defenses. Of his 15 players, Coach Arseneault will typically have 4 - 6 squads of five players (various 5-player combinations) that he uses. He will substitute five new players every two minutes or so, keeping fresh legs in the game at all times, wearing the opponent down by the end of the game. Many players will get playing time and no-one plays the entire game. You will need two or three good point-guards who can score, otherwise forget this system. So would you want to use this for your high-school team? Um... probably not unless you have 15 good athletes who can really "go" and shoot. So why bother to read on? Well, I think it's always good to learn something new, another way of "skinning the cat". Even if you don't see your team running this offense, you might extract and use parts of it for your team. 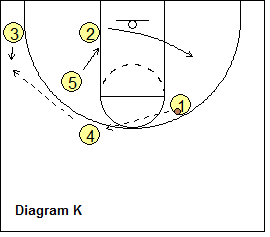 For example, you might like to use the Grinnell secondary break off the made basket. Or you might like their circular screening action, or their 2-man game, or their press defenses. So read on and take a look at Coach Arseneault's DVDs. 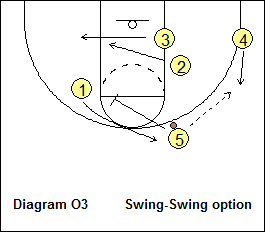 In this article, I'll present some of the basic offensive options as an introduction. However, the DVDs are much more detailed. As soon as the opponent scores, our big man O5 gets the ball out of the net, before it hits the floor, and immediately steps out-of-bounds, while chinning the ball. We want O5 to keep the ball up high so he can make a quick overhead pass inbounds to O1... a chest pass takes a little longer to execute with having to step into the pass. We want O1 to get the ball and speed-dribble it up the middle of the court, as all offensive options begin with our point-guard O1. 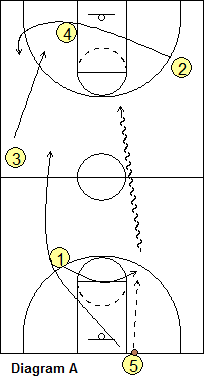 O1 circles from left to right (diagram A), gets the pass and speed-dribbles up the middle one-third of the floor. 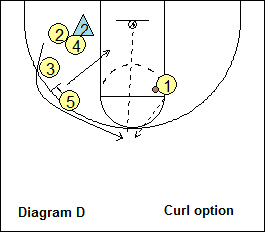 We want O1 in the middle so he can attack with the dribble-drive right up the lane as the first option. Diagram B. 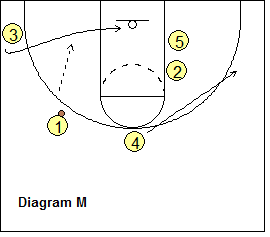 If the defense denies the pass to O1, O3 (who starts from just beyond half-court) sprints up the left side and gets the inbounds pass from O5. O3 then passes to O1 and now O1 is ready to attack with the dribble. Diagram C. O4 sprints to the left low block area and O3 sprints just above O4 near the arc, while O2 sprints to the right wing. O5 is the trailer up the left side about 12-15 feet behind O1. 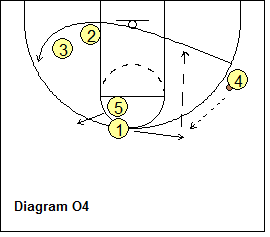 As O1 speed-dribbles into the forecourt and begins his dribble attack, O2 cuts underneath and around double-staggered screens set by O4 and O3. This action completely clears out the right side of the floor. O1 attacks right down the lane for the lay-up. 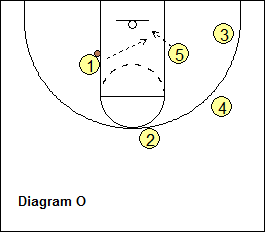 This is our first option every time down the floor... O1 scoring off the dribble-drive. Notice in diagram C that if O1 does not have the lay-up, he keeps his dribble alive, turns and dribbles back up to about the right elbow area. O4 is our "head-hunter" screener and gets a piece of the X2 defender, the first screen for O2. The X2 defender may either (1) chase around the screen, or (2) go over the screen. O3 reads this and if X2 chases, O3 sets the next staggered screen for O2 making a curl cut (diagram D). In fact, O3 will yell to O2, "Curl!" when he sees X2 chasing. About this time, our trailer O5 arrives and sets the third staggered screen for O2. 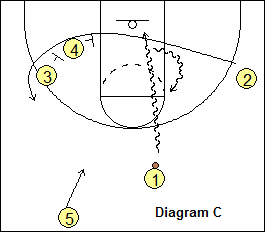 O1 can pass to O2 for an open 3-point shot (diagram E), or to O5 slipping the screen inside. 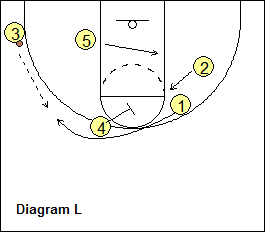 Diagram F shows how the second screener O3 has to read the defense, make the call and set the correct second screen. As we have just seen, if X2 chases around the screen, O3 sets the curl screen for O2. If O3 sees X2 going over the screen, he yells "Fade!" 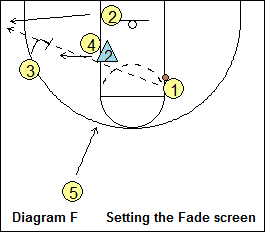 and sets a fade screen instead (diagram F) and O2 fades to the corner. 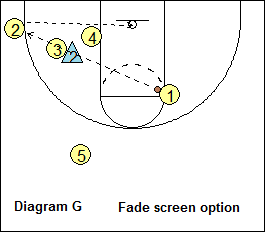 O1 then passes over the screens to O2 in the corner for the open 3-point shot (diagram G). 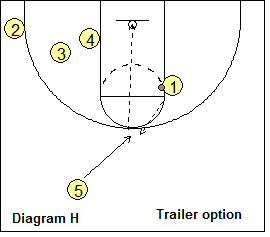 Diagram H. If our trailer O5 is left unguarded, he simply fills in to the open spot on top and gets the pass from O1 and the 3-point shot, while the other four players all rebound. Diagram I shows O2 making the first cut around the triple staggered screens. 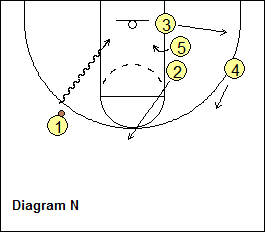 If O2 does not get the pass on the top, he back-cuts inside to the hoop. 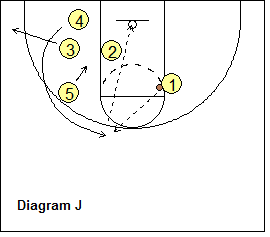 Meanwhile, O4 cuts around the double staggered screens set by O3 and O5 (diagram J) and he could also get the pass from O1 and the 3-point shot. This option gets us to use the other side of the court and we'll end up with our circular screening motion on the right side of the floor. In diagram K, if O4 gets the pass but does not have an open shot, he passes to O3 and O4 then screens for O1 (diagram L), as O2 and O5 start to clear to the opposite side, getting ready to become screeners. O1 comes over O4's screen and gets the pass from O3. O4 goes off to the right wing (diagram M) as O3 back-cuts for a possible pass from O1. O3 continues through around O5's screen (diagram N) as O4 rotates up. 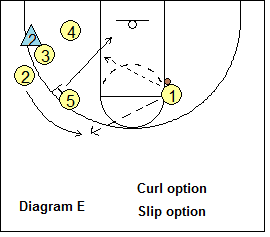 Diagram N also shows the clear-out for O1 to attack with the dribble for a lay-up, or a pass to O5 cutting to the hoop (diagram O). 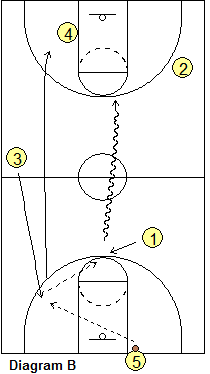 If O1 does not have the lay-up, he keeps the dribble alive and circles back up to the left elbow area, and now we can run all the same circular motion cuts on the right side of the floor (diagram O2). 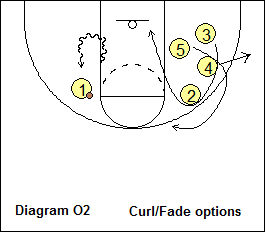 Here, O3 curls around O4 and O2 and could get the pass on the top for the open shot... if not, he back-cuts through as O5 cuts around the staggered screens and O5 could get the pass and shot. If O5 gets the pass at the top, but the shot is not open, he starts the "swing-swing" option by passing to O4 (diagram O3). 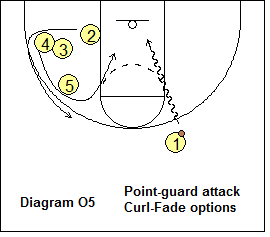 O5 then screens for O1, and O1 comes over to get the swing pass from O4, as O4 back-cuts (diagram O4) and starts the curl-fade option on the left side. Now we are back in our original set (diagram O5) with O1 attacking with the cleared-out right side, and the curl-fade motion screening options on the left side. JOIN NOW! Become a Member! Get the rest of this article is in the Premium Members section and the Playbook download. "Forcing Tempo - Grinnell Defense" with Dave Arseneault.